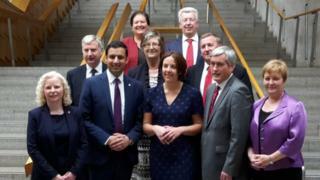 Image caption Scottish Labour's front bench team at Holyrood - could one of them be in the frame for the leadership role? Kezia Dugdale's sudden resignation has opened up a leadership contest at the top of the Scottish Labour Party. Who are the frontrunners to replace her? Scottish Labour has had its own distinct leadership position for six years, but already there have been five incumbents - three full-time (Johann Lamont, Jim Murphy and Ms Dugdale), and two caretakers (Anas Sarwar and Iain Gray). The previous leadership contest came down to Ms Dugdale and Ken Macintosh, and both are now out of the picture - Ms Dugdale is retiring to the back benches, while Mr Macintosh has a rather more prominent if politically neutral position as Holyrood's presiding officer. A series of politicians have already ruled themselves out, but with the party's Scottish Executive Committee meeting on Saturday 9 September to decide on the timetable and process of the leadership election there is plenty of time for speculation over who could be in the frame. A former deputy leader of the party, when he was MP for Glasgow Central, Mr Sarwar was interim leader between the tenures of Johann Lamont and Jim Murphy in 2014. He lost his Westminster seat in 2015, but was returned as an MSP for the Glasgow region the following year. An experienced politician within the party, he has immediately taken up a prominent role in the group at Holyrood, acting as health spokesman. Mr Sarwar could be pitched as something of a unity candidate, who could potentially seek support from both sides of the party's somewhat divided base in Scotland - the only part of the UK where Owen Smith beat Jeremy Corbyn in the 2016 leadership contest, at least in the popular vote of the membership. He introduced Mr Corbyn at a recent rally in Glasgow, and could be positioning himself as a favourable choice for both moderates and the left. Richard Leonard is a newcomer to parliamentary politics, having been elected to Holyrood on the Central Scotland list in 2016 - but he has been a voice on the left of the Scottish party for some time. He has a strong trade union background with the GMB and the TUC, and could find himself the main pro-Corbyn candidate after Neil Findlay and Alex Rowley bowed out of the race before it even began. He is an economy spokesman for the party at Holyrood, and was a key figure in drawing up the party's industrial strategy for Scotland. Despite his lack of parliamentary experience Mr Leonard has a host of campaigning and party work behind him: he served on the Scottish Living Wage steering committee and is secretary of the Keir Hardie Society. As the current deputy leader of the party, Alex Rowley steps into the breach as caretaker, with Ms Dugdale's resignation taking immediate effect. However, could he potentially quit that position to take a tilt at the top job himself? The answer quickly became clear: no. Mr Rowley said the next Scottish Labour leader should be looking to become first minister, an ambition he does not personally harbour. A former leader of Fife Council, Mr Rowley has leadership experience at local authority level as well as having spent a year as general secretary of the Scottish Labour Party, between 1998 and 1999. He formerly worked for Gordon Brown, but might have looked to attract votes from the Corbynite left of the party as well as backing from trade unions. His daughter Danielle was elected as MP for Midlothian in June's general election. Seen as Jeremy Corbyn's biggest ally in Labour's Holyrood group and convener of the Scottish Campaign for Socialism group, Neil Findlay was immediately talked about as a potential successor for the Scottish job. However, he quickly ruled himself out of the contest, saying he would not be putting his name forward. He endorsed Ms Dugdale in 2015, and has been a vocal presence on the back benches, as well as serving as the convener of Holyrood's health and sport committee. Mr Findlay has recently written a memoir, entitled Socialism and Hope, complete with a foreword by Mr Corbyn. He says he prefers to continue in his current role, to "hold the SNP to account, expose the Tories and work towards returning Labour governments at Holyrood and Westminster". Jackie Baillie stood in as Labour's acting leader in the Scottish Parliament while Mr Sarwar was interim leader in 2014. However, she declined to stand in the leadership election at that point, following Ms Lamont's departure, saying she preferred a "supporting role". Could that have changed in the intervening years? Moderate voices in the party have been pushing her as a possible centrist option, as an alternative to the inevitable Corbynite candidate - whoever that might turn out to be. An experienced politician, she has been an MSP since the birth of the Scottish Parliament, taking up her seat in 1999. She is also one of the party's three constituency MSPs, having successfully defended her Dumbarton patch in 2016 - partially thanks to her stout defence of Trident, which props up many local jobs at Faslane. One of the notable things about Kezia Dugdale's time at the top of Scottish Labour was that for much of it, each of Holyrood's top three parties were led by women. However the likely candidates mooted so far are, for the most part, middle-aged men. On that front, it is possible that an up-and-coming female MSP like Monica Lennon might be encouraged to stand. She is relatively new to front-line politics, having first been elected to the Central Scotland region in 2016, but has developed a good reputation at Holyrood in particular for her forensic work on the public audit committee. However, Ms Lennon was also quick to rule herself out of the contest. James Kelly, a close ally of Ms Dugdale, was initially mooted as a potential long-shot continuity candidate. He is currently the party's business manager at Holyrood, and has been an MSP for a decade; formerly as member for Rutherglen, and for the Glasgow region since 2016. He also ran the party's campaign in the 2016 elections, and has served in a series of different roles within the parliamentary group.